Candied ginger. Ginger candy. (Not the same thing, by the way.) Ginger Altoids. Pickled ginger. Ginger tea. Ginger beer. Gingerbread. Ok, not so much the gingerbread because I don’t always eat desserts, but when I do, I prefer Dos Equis (because I’d rather drink beer than eat something sweet). Always obsessed with all things ginger, and now? I have not yet been brave enough to drink straight ginger juice and probably never will. I’m no expert (but I play one on my blog!) but I don’t see a reason why you want to risk possibly burning spice-sized holes in your GI tract by shooting big gulps of straight ginger. 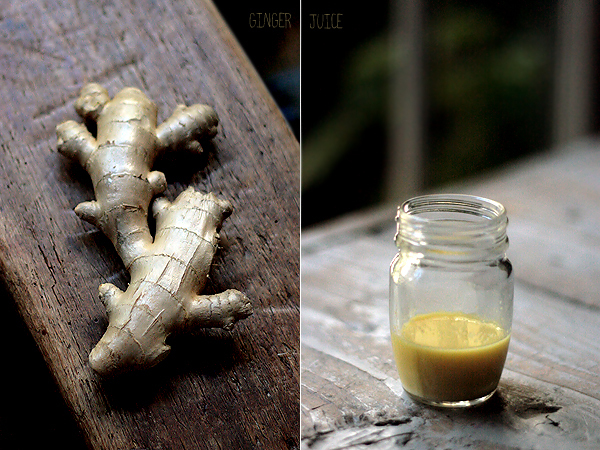 Though ginger has long been used for medicinal purposes to ease nausea, fight inflammation among other ailments, it is more a flavor factor for me than it is an herbal medicine. Concentrated into juice, it is so potent, a scant quarter teaspoon added to a tall glass of any other juice will dramatically tip the taste scale toward spicy ginger. But even if consuming ginger juice were strictly for health reasons, I can’t imagine that you would need to drink more than a couple of tablespoons every day at most. That amount is small enough to add as an ingredient, again, to a larger amount of other juice. Or even a glass of sparkling water. If you need more ginger than that for your health, you should just swallow pills. Are you obsessed with ginger? What are some ways you use it that I can try, too? Rinse ginger. You don’t have to peel it. Grate ginger on a microplane grater or on the side of a box grater with the smallest holes set over a cutting board or a well-stablizied bowl. Place all the grated ginger in the center of 2-3 layers of cheesecloth. Wrap up, and squeeze the ginger in the cheesecloth over a bowl to catch the juice. Squeeze hard to get as much juice as you possibly can out of the ginger. Or you can send the rinsed, unpeeled ginger through a juicer. Whether you grate and squeeze the ginger by hand or use a juicer, save the semi-dry grated ginger to use in recipes that call for grated or minced ginger. The grated ginger is not as strong anymore since you squoze most of the juice out, but the “essence” is still there. The ginger pulp is easy to scoop out of the pulp container of the juicer. I also make sure to “scrape” pulp off the mesh screen. Put it in a small air-tight container and try to use it as soon as possible, since it will eventually dry out.